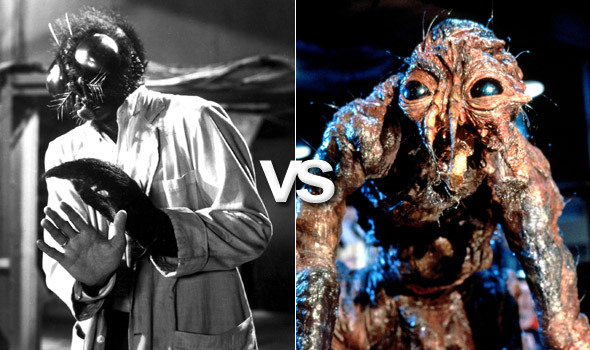 Fright Nights: THE FLY (1958) vs THE FLY (1986) | Warped Factor - Words in the Key of Geek. It's a fairly difficult job to review these two films objectively, purely because the production values associated with the projects are nearly thirty years apart. In the time that elapsed the developing industry had attained additional skills and resources across the board to meet the changing tastes of a more sophisticated and demanding audience. Special effects, make up and costume design in particular had undergone dramatic changes, in an effort to captivate and wow popcorn munchers near and far. It's fair to say that if yet another remake were made today the gulf between all three would be even more noticeable. We also have to acknowledge that there is a general stigma involved towards 'old films', a baffling prejudice that afflicts many people I know and a growing number of younger, so-called, movie fans. Some of them will remain close minded regardless of how much we may try to convince them otherwise, and as a result they will immediately dismiss the 1958 version of The Fly, which is a pity. Before we start, let's pause for a second to consider the prodigious talent of Vincent Price. 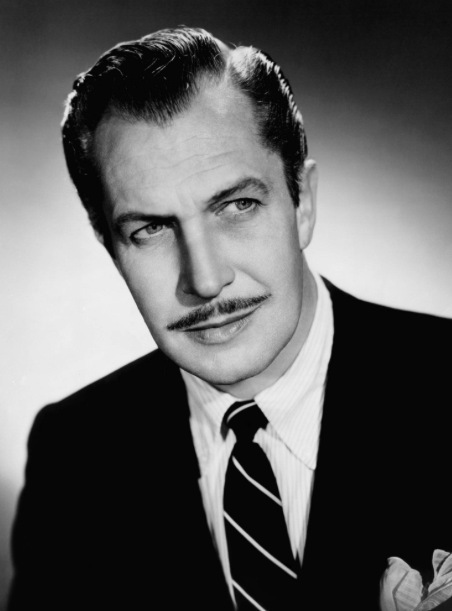 Yes, he has become a legend primarily for his various roles in the horror genre, and quite rightly so, but his quirky presence sometimes made it appear as if he were playing a part with gleeful and hammy overkill. You sense that Price never took himself very seriously and far from being annoyed with playing roles that firmly anchored him to the horror genre, he seemed to enjoy it, accepting it as a steady income whilst acknowledging that it was simply playful nonsense. He once said "Someone called actors 'sculptors in snow'. Very apt. In the end, it's all nothing." And added "The horror thriller offers the serious actor unique opportunities to test his ability to make the unbelievable believable." Price looked like a praying mantis in a suit and had a unashamed liking for frequently pulling a series of faces reflecting a degree of astonishment (even when there wasn't much to be astonished about), These standardised 'shock and surprise' looks emanated from a face that looked like it was fashioned from suet pudding, and which bore more than a passing resemblance to Splinter of the Mutant Ninja turtles, or the artist Salvador Dali.Price was certainly unconventional in his appearance. He had a thin moustache, like the hands of a medium sized kitchen clock, perched upon pencil thin lips. He also sported two perfectly symmetrical eyebrows that resembled a brace of slugs doing the rhumba, and a long thin nose, one assumes for sniffing out truffles. Though he was never likely to join the ranks of Hollywood heartthrobs, whatever he may have lacked in looks he more than made up for with that voice. Part Shakespearean, part undertaker, Price could make a greeting sound sinister, and with each series of exaggerated and punctuated lines he seemed to suggest to whomever he was addressing that they had a short lifespan - which in most cases, they did! Price enjoyed a lengthy career, which included over 100 films, but a generation possibly best associate him with the vocal he recorded for Michael Jackson's Thriller. That song was single handily responsible for reigniting interest in the veteran and led to more film roles including Tim Burton's Edward Scissorhands. So on to the film. 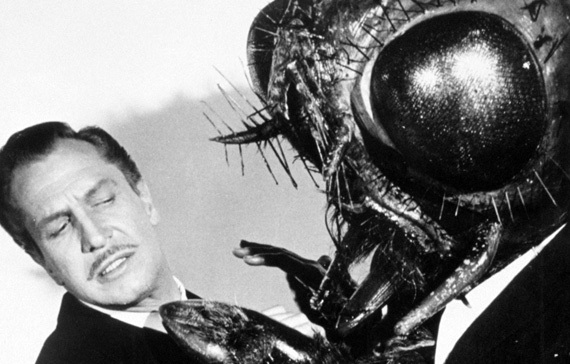 The original version of The Fly was directed by Kurt Neumann with a screenplay written by James Clavell, which in turn was based on an idea by George Langelaan. It has it all, a kindly night watchman that offers romantic advice to a cat, a love triangle, a trashed laboratory, a detective in a hat, a sickly sweet child and a gruesome murder. What more could you want? It also has the feeling of watching a play, possibly a performance held in a shabby barn somewhere. This works to its advantage. Opening with a death, one which could be filed under suspicious circumstances as his wife Helene (Patricia Owens) confesses to crushing her spouses head and arm in an hydraulic press. 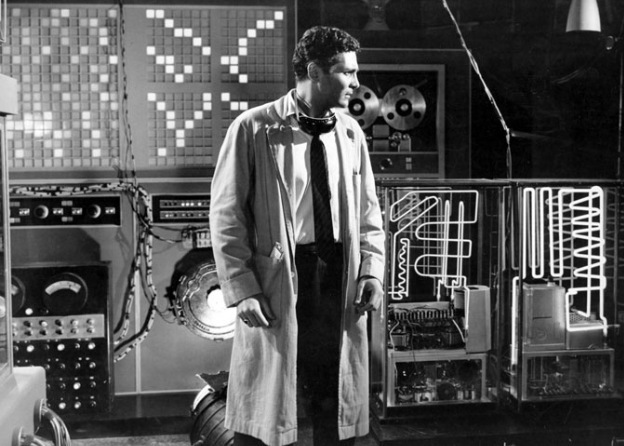 From there we flashback to tell the story of scientist Andre Delambre (David Hedison) who has toiled in his dark and gloomy confines to invent a matter transporter device called the disintegrator-integrator (catchy-notcatchy name). David Hedison as scientist Andre Delambre in Voyage To The Basement In The House. But although it sounds as if he's on the verge of a major scientific discovery, his tests on animals have proved less than impressive. So as these scientists types tend to do in these situations, Delambre ignores the risks and subjects himself to human testing. Big mistake. Huge. One would have thought that the disappearance of the family cat and a guinea pig may have made him slightly more wary, but undeterred he forges ahead, and as we were expecting, he is soon wishing he hadn't. Neumann uses flashbacks to cement the story and shows Andre, Helene, and their son Philippe (Charles Herbert) as a happy and loving family prior to the unfortunate experiment. Price plays the role of Andre's brother, Francois, who tries to discover the truth regarding his siblings death. He is soon deeply troubled by Helene's reaction to encountering a fly, gradually he manages to persuade his sister-in-law to recall what really happened. "We're going to need a bigger newspaper"
It's obvious that the 1958 version of The Fly has dated considerably. The script is somewhat clumsy and overly long in places and would benefit from a hefty dose of slick editing, especially in terms of pace. But it is a genuinely good film that punches far above its weight. It's extremely watchable, even if the Man-Fly make up is a little bit 'man in a mask' - this alone must have pushed the budget spiraling to nearly £10! Yet it doesn't harm the film at all because it was streets ahead of anything around at the time, giving a totally new angle on suspense, whilst taking a very respectable $3 million at the box office. Sadly, Kurt Neumann never got to enjoy the success, dying before the premier, but it did establish his legacy and left us with an almost ground breaking moment of cinema. 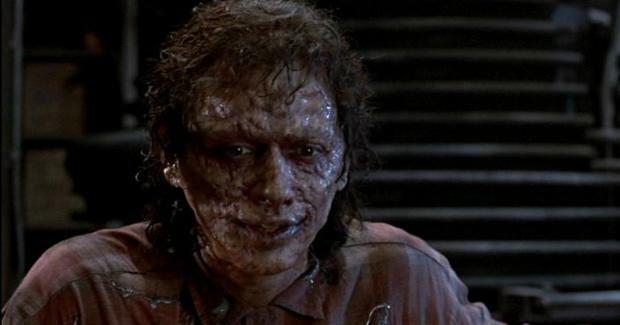 The Fly almost single handedly changed the science-fiction/horror genre by offering a new direction - the failed experiment. Giving it a new twist on Jekyll and Hyde with a little dash of Elephant Man thrown in for good measure. It also provides a warning about the path of scientific research and how damaging it can be, something that seems to have been blatantly ignored in the modern world. Come to think of it, how would Marvel Comics have managed without this particular film? Bruce Banner's exposure to gamma radiation, and Peter Parker's spider bite could easily be as a result of Stan Lee watching The Fly. Fast forward to David Cronenberg's 1986 version. Released at a time where gore was becoming extremely fashionable, it's basically a rehash of the earlier films story-line but it pursues a new direction between the two main characters who become romantically involved. The film starts sedately enough by introducing the viewer to the divinely eccentric inventor Seth Brundle (Jeff Goldblum) who meets a wide eyed, aspiring reporter called Veronica Quaife (Geena Davis) at a science convention where he grudgingly tells her about his invention - a teleportation system which will "change the world" (they all say that). The hungry reporter wants to document every aspect of the process and jumps at the chance to observe the 'goings on' at first hand. This includes diving between the cotton sheets with Brundle and getting jiggy with it. Mr Goldblum is a source of fascination on the big screen. He looks as if, as a child, he was put through one of the Telepods and got mixed up with a lizard! It's as if his head is on too tight, and you sense that at any moment an overly large tongue may whip out at speed to sweep hair out of his face or to consume an ill fated passing bug. His gangly frame and over articulated limbs seem to dominate every scene, his voice is that of a vole in a cement mixer, but Goldblum embraces these oddities, and it turns out that he is quite a decent actor, not least in this role. Like the previous film the animal testing goes horribly wrong, this time with a baboon. Yet dispute the implications of that particular horror show Brundle forges ahead (sound familiar?). The test on the scientist himself appears to be a resounding success, but we witness the inclusion of a pesky fly into the teleportation pod. Both are disassembled and reassembled in the opposite chamber, but Brundle is yet to realise that both have merged. As a result Goldblum's character develops phenomenal strength and agility coupled with an insatiable sexual appetite (ooh I say), and as the chemical imbalance develops he becomes fickle, irrational, angry, selfish and self absorbed. Quaife notices the changes (up close and personal) including his personality and a number of coarse hairs which appear on his shoulder. Things go from bad to worse as he starts to mutate in to 'Brundlefly', a process that is quite gory to say the least, and would likely make even a bunch of Hell's Angels vomit into their own helmets. We see Davis dragged through the emotional wringer as the man she loves deteriorates and virtually disintegrates before her very eyes. She is reduced to a bystander who is eventually repulsed by his accidental metamorphosis. It's all quite graphic and I'm in some doubt whether it needed to be. Some of the physical changes were clever and inventive whilst others were just unnecessary. Goldblum has our sympathy at one point, then loses it rapidly, becoming the villain of the piece. We no longer care about his plight and just want him to get some good, old fashioned comeuppance. I quite like a film that does that type of thing, one which messes with your morality and convictions, one that makes you change your perspective as quickly as you might change your socks and this version wins hands down in that respect. To some degree Cronenberg took what was essentially a solid story and fashioned it into something less appealing. 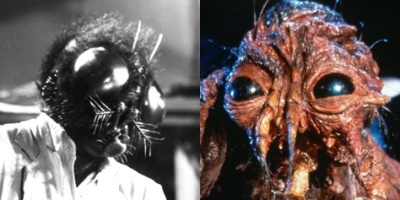 The reason for this is the 1986 version of The Fly becomes more of a visual effects vehicle rather than a triumph of script writing, acting & directing. By comparison '86 Fly wasn't anywhere near as groundbreaking as its predecessor, so although the concept was refreshed it falls short of being a truly wonderful film. The '58 version, perhaps because of audience sensitivity, was more of a cerebral affair but Cronenberg's chose the shock and revulsion route, and its quite heavy handed in that respect. What begins as a film about Brundle and his relationship with Quaife, as well his blind ambition and impetuousness quickly turns into an effects fest, and, of course, the effects aren't quite so special today as they were 30 years ago. So out of the two I'm drawn to the original for its clever use of limited resources. It focuses on how to tell a story and how to tell it well. I'd prefer to follow the account of the tormented wife of a scientific genius and learn how her husband met his end, rather than see a man vomit on his food then eat it again, or lose his finger nails and teeth. Truth be told, I liked both, but Cronenberg's didn't give me the same buzz.